Lock, put your Mac into sleep mode and start your screensaver. Is there a better alternative to QuickSleep? Is QuickSleep really the best app in System category? Will QuickSleep work good on macOS 10.13.4? QuickSleep allows you to put your Mac into sleep mode, lock your Mac, start your screensaver, and more. 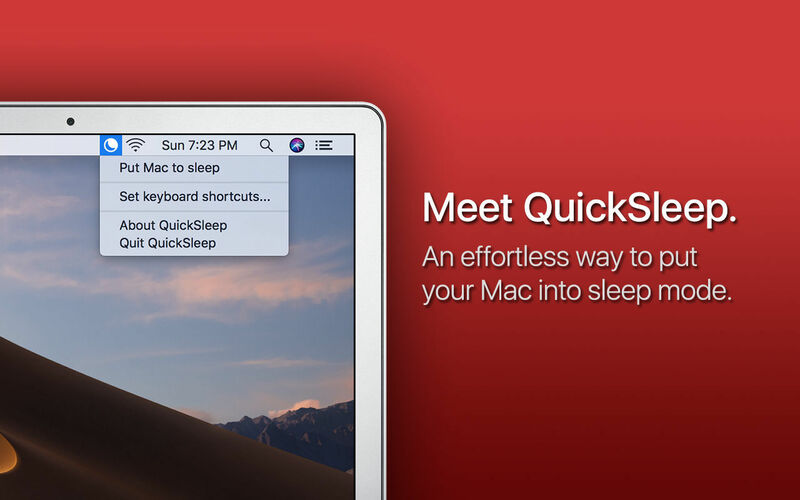 Effortlessly put your Mac in sleep mode - With QuickSleep, putting your Mac in sleep mode has never been easier - it only takes one click. Start your Mac's screensaver quickly - If you don't want to put your Mac in full sleep mode, you can simply start screensaver mode instead to keep unwanted intruders out of your account. QuickSleep needs a rating. Be the first to rate this app and get the discussion started! Customizable keyboard shortcuts - QuickSleep allows you to set keyboard shortcuts to put your Mac to sleep and start screensaver mode, without having to trigger QuickSleep from the menu bar.